Compare Bullet Blenders: Magic Bullet or NutriBullet? There are dozens of brands and types of blenders and juicers out there, but bullet type blenders belong to a special category. They can be used to accomplish different goals such as chopping vegetables, pureeing baby food, blending healthy smoothies, grinding coffee, or mixing cocktails. They represent an ingenious combination of juicer, blender, food processor, chopper and grinder, but they occupy less kitchen counter space than your usual juicer, blender or food processor. The two bullet blenders to be compared here, NutriBullet and Magic Bullet, have an elegant streamlined design with no confusing buttons, touchpads or knobs. In fact, they don't even have a power button. The motor is simply activated by pressing down on the food cup. You just need to pulse the cup for varying number of seconds to mince, chop, and mix ingredients, or hold the cup down for a slightly longer period to blend, puree and liquefy the contents. Furthermore, these devices use special extraction blades in conjunction with cyclonic action to break down food ingredients and pulverize the stems, seeds, and skins where most of the essential nutrition lies. If you want to absorb easily all the rich nutrients stocked in fruits and vegetables, you can’t just juice or blend them: you need to extract them. And that’s what these bullet type blenders do. Note: You will notice that the Magic Bullet logo is sometimes embedded in the base of the NutriBullet units. hat is because today NutriBullet and Magic Bullet blenders are made by the same company. Although the Magic Bullet logo may be there, as long as it also has the NutriBullet logo in the main body, the blender is a NutriBullet. NutriBullet and Magic Bullet are the most popular bullet type blenders that combine quality, elegance, functionality and ease of use. Not only are these two products top sellers in the Amazon bullet blender category, but they are also at the top of the best seller list in the overall blender category! And customer reviews have been mostly excellent. You will find below a comparison of Magic Bullet and NutriBullet. NutriBullet and Magic Bullet Blenders on Amazon. Load the ingredients into the provided cup/mug. Twist on the the cover which has a built-in blade, until the cover and cup have a tight seal. Mount the covered cup/mug on the power base. Press down on the cup/mug to turn it on and start the device. As long as you're pressing the cup down, the device keeps running. To stop the action.you simply stop pressing. Now, if you press down and turn the cup clockwise until it locks in place, you can take your hands off and let it run for as long as you want. But it is recommended not to run these units too long to avoid heating of contents.To turn the unit off, simply twist the cup back counterclockwise and release the cup. Note that the blender cups/mugs for both products are made out of non-toxic high-impact plastic. Unlike glass, they do not shatter when dropped. They are all BPA free. Also, except for the power base, all cups and lids for both products are top-rack dishwasher safe. NutriBullet is a 600Watts unit while Magic Bullet has only 250Watts. As a consequence, NutriBullet is a lot more powerful and is ideal for making smoothies and drinks, more so than the Magic Bullet which is more suitable for rougher blending tasks. This also means that NutriBullet breaks better the cell walls of the ingredients releasing more nutrients so that they can be better absorbed. Another difference is the blending cup size. The largest NutriBullet cup has a 24-ounce capacity while the largest Magic Bullet cup can hold only 18 ounces. So you can add more varieties of ingredients into the NutriBullet cup and hence produce and absorb more healthy nutrients than Magic Bullet can provide in a single preparation. Magic Bullet comes with two (18-ounce & 12-ounce) blending cups and four “party mugs” that are basically large mixing cups with handles. There are also four colored comfort lip rings for the mugs, two resealable lids, two shaker/steamer type lids with holes in them, and a recipe book. On the other hand, NutriBullet comes with one 24-ounce and two 18-ounce blending cups, resealable lids, plastic rims for the cups, a user guide, a nutrition guide (Pocket Nutritionist), and a recipe book. 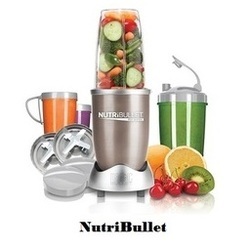 NutriBullet comes with an Extractor Blade and a Milling Blade. The Extractor Blade is the primary blade and is used for breaking through tough seeds, thick stems and tough skin to access the hidden nutrition inside. The Milling Blade is ideal for milling grains, grinding fresh herbs and chopping nuts. Magic Bullet comes also with two blades: a Cross Blade for chopping, grating and blending foods, and a Flat Blade for whipping cream and grinding hard foods like coffee beans and spices. The blades for both products are made of stainless steel and never need sharpening. So in conclusion, we can say that both products can accomplish similar functions, but NutriBullet does them much better because of its size and power. Please click the product of your choice below for exact price information or to purchase.